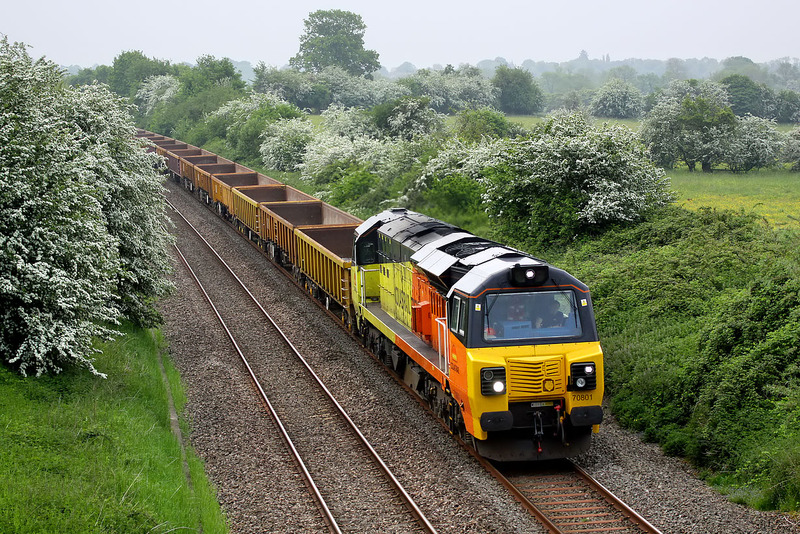 70801 passes through a scene dominated by hawthorn blossom, as it passes Evenlode on 28 May 2016 with the 6C22 05:40 Hinksey to Standish Junction engineer's train, conveying wagons for use in a major Bank Holiday track possession. It could clearly be heard approaching from several miles away, in the still morning air. This was the third of six departmental workings over the Cotswold Line on this morning, and while the preceding one was theoretically photographable, the first one definitely wasn't, as it passed this spot just after midnight, running over 90 minutes early!